Quinoa Khichadi in the Microwave! The nutritious qualities of quinoa are what inspired me to come up with this recipe, but the taste is what made it a hit in our home. This is a protein-rich take on sago (sabudana) khichadi! Delicious, easy to make, and good for you, quinoa khichadi is sure to be a winner at your home, too! Wash the quinoa well using a strainer with a fine mesh. This helps eliminate the ‘bitter’ taste of quinoa. Cook it according to the package instructions for microwave cooking, or combine it with 2 cups of water and a pinch of salt and cook it in a rice cooker. When it’s slightly cool, fluff it with a fork. In a separate microwave-safe bowl, combine the oil, ghee, cumin seed, green chili/chilies, and the thinly sliced potato. Heat on high for about 2 minutes, or until the cumin seeds sizzle and the potato slices are cooked. Remove from the microwave. Add the cooked quinoa, crushed peanuts, brown sugar, cumin seed powder (if using), and the salt. Stir well to combine, and heat in the microwave one more minute to marry the flavors. Remove from the microwave, and squeeze the lemon juice over the khichadi. Toss, and serve topped with the grated coconut and the chopped coriander/cilantro leaves. Weekend Chat with a Scoop! Figure Friendly Lentil Salad with Chutney Dressing! 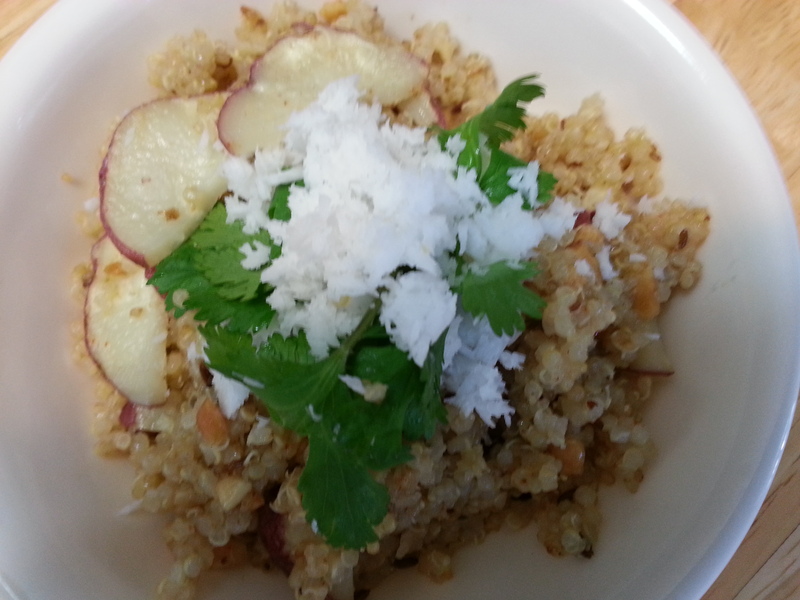 Love your take on this quinoa dish Sandhya, it is packed with nutrients and taste. Love the coconut bits on the top too. This would make a wonderful lunch or for that matter a great dinner too. I’m really cross with myself these days, I’m still struggling to lose the 4 pounds that I put on over the Christmas break. Of course it doesn’t help when I look at blogs with desserts and cakes :). Your dish would definitely be welcome in my home, I’m staying away from anything sweet for now 🙂 Thanks for sharing. Thanks Loretta. Imagine how cross I am with myself for gaining 16 pounds this past year. I am struggling to shed it and these healthy recipes help. I somehow find that hard to believe Sandhya. You’re not comparing yourself to before you had kids eh? Cos if that’s the case……..:) How lovely that you will be in California, I know your daughter lives there now right? Well, have a super time, at least the weather will be better for you. Ha Ha Loretta, I don’t even dare compare with my weight back then! I love food in California in general…I think it tatses fresher…..could be just me:) and have a favorite seafood place that is a fusion of Vietnamese and Cajun cooking. So will be pigging out again! Loved your post this morning and want to go to Louisiana. Thanks Robin. I recently got red quinoa too . It somehow seems to be heartier….may be it is just its robust color but I liked it too.